You’ll find travel right at the top of my list of favourite things, closely followed by dogs, coffee, and chocolate. Whilst Café Frei has nothing to do with dogs (boo! ), it has everything to do with travel, coffee, and chocolate. Amazing! I struggle to function without my morning coffee, ideally in my minion mug if it’s the weekend! During the week, I’ve turned into that person with my travel coffee mug on my commuter train into London. There’s nothing worse than guzzling down my hot coffee at breakneck speed as I rush to get ready for work. Now imagine a cafe specialising in coffee from around the world. Welcome to Cafe Frei. 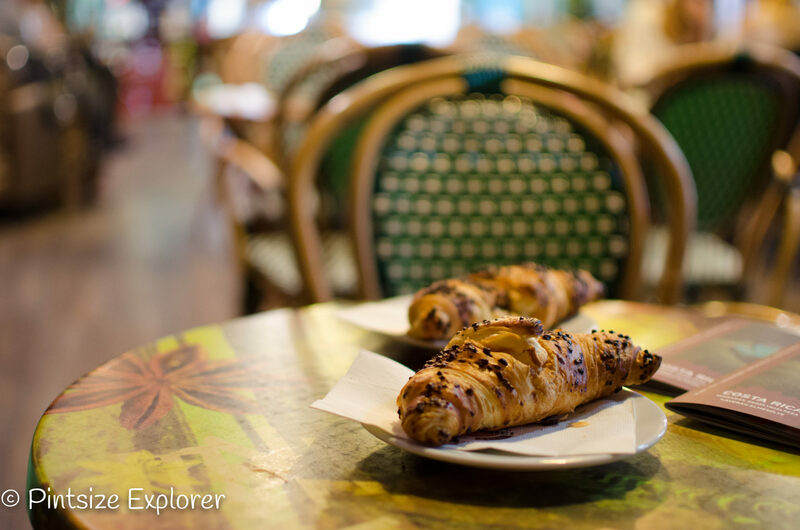 This cafe has a tantalising menu, offering over 70 different varieties of coffee, carefully selected from each continent. Finding Cafe Frei was actually a bit of an accident for Adam and I. We were heading back to our apartment on our first day in Budapest, when we spotted their menu board outside on the street. Our eyes zoned in on ALL the different drinks, and we immediately made a detour out of the rain and into the warm café. This inviting café had a plethora of industrial looking coffee making contraptions as you enter, including several maps outlining the different types of coffees available from those countries. There was an upper level full of seating, surrounded by a bold choice of green and orange decoration. 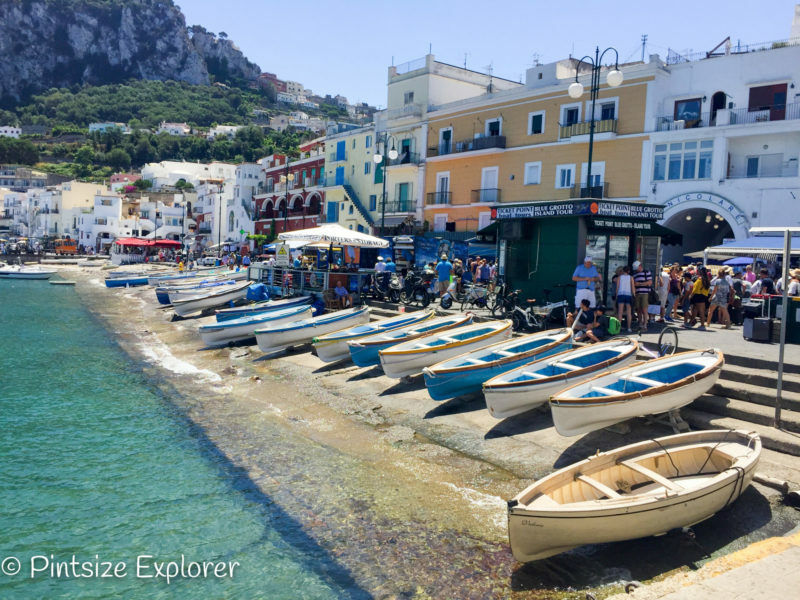 Conveniently the cafe was just a few minute’s walk from our apartment. This meant we found ourselves popping in each morning for breakfast over the next few days. A good excuse to try lots of the different coffees anyway! 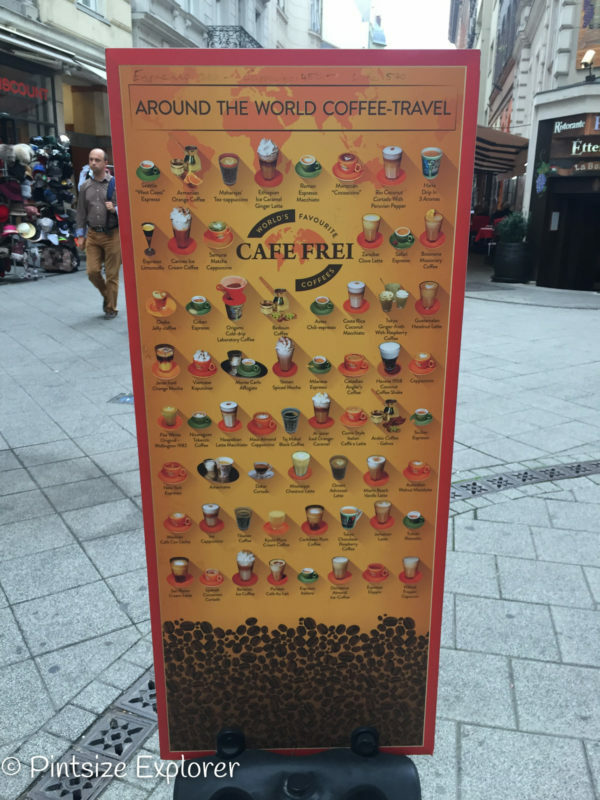 The menu is cleverly split into different coffee kitchens from around the world, and then further split into different types of drinks. 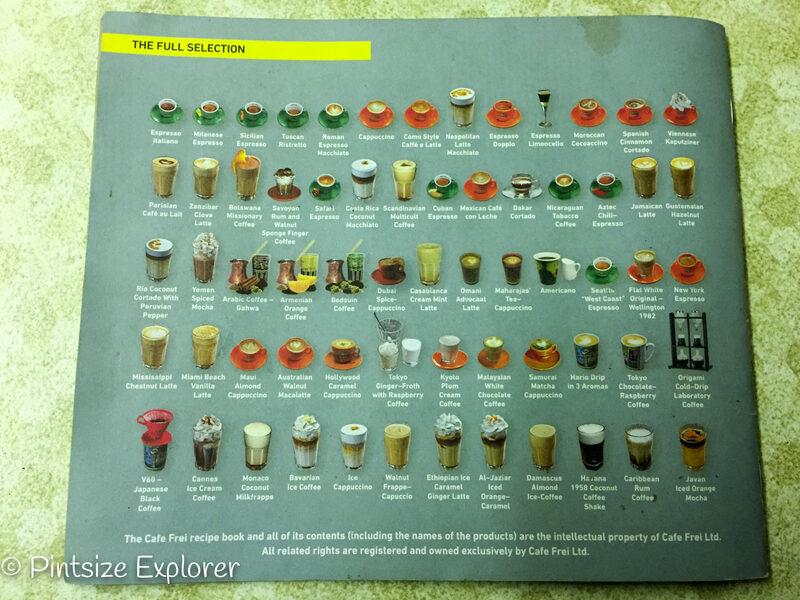 Ranging from tall drinks to short drinks, hot drinks to cold drinks, the menu was insane! Italian Coffee Kitchen – Creamy espresso bases, with slightly bitter aromas. 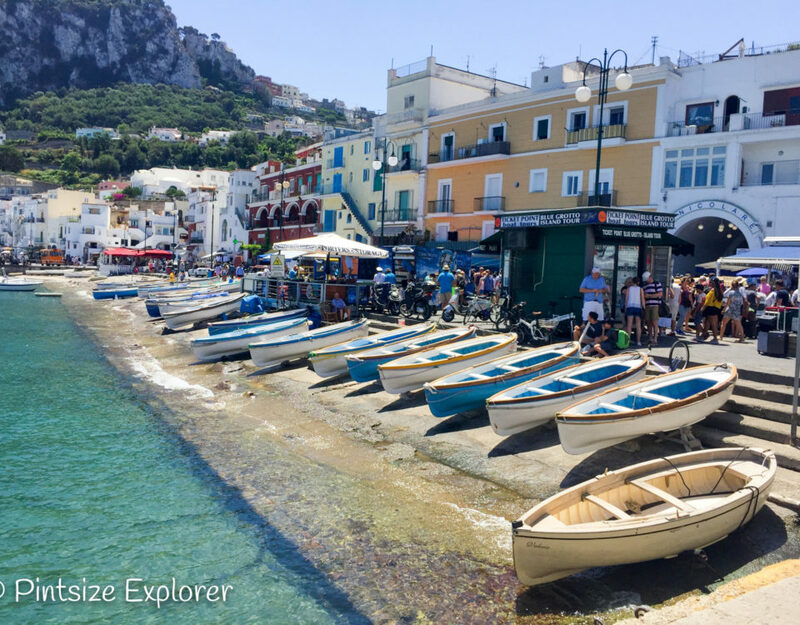 Keep an eye out for the espresso limoncello! 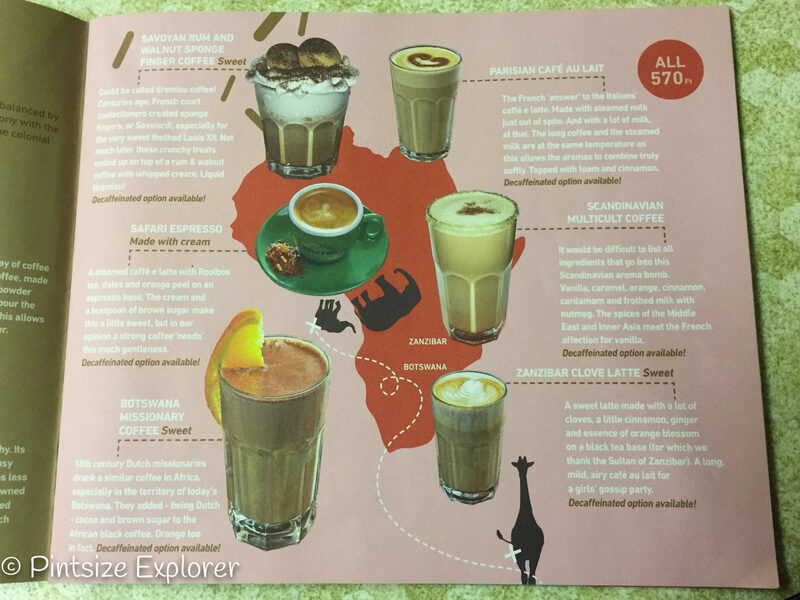 French Coffee Kitchen (from Europe & Africa) – Slightly sweet milk coffees, with a hint of Africa’s citrus’ness. Latino Coffee Kitchen – Featuring lots of spices and exotic fruits, as well as some alternative flavours here to try, including tobacco and chili peppers. 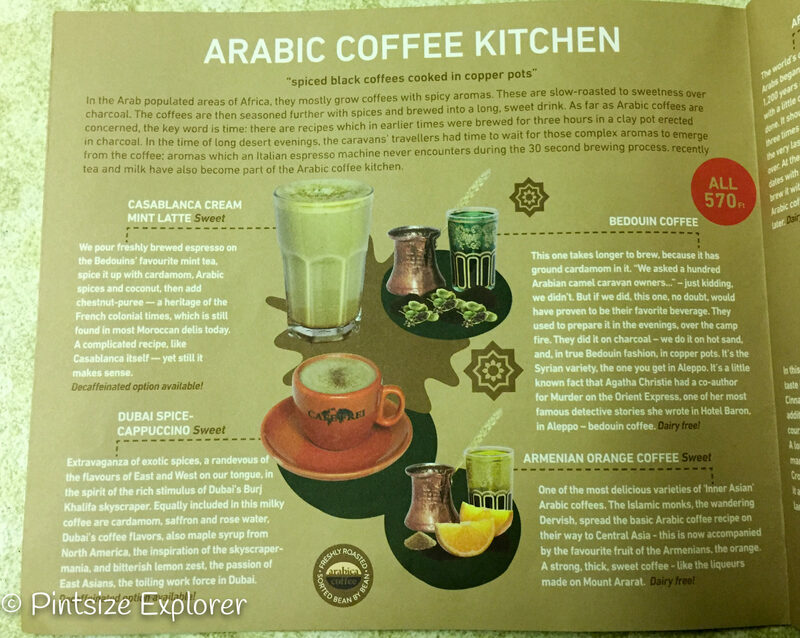 Arabic Coffee Kitchen – Spiced black coffees cooked in copper pots. American Coffee Kitchen – Long coffees with natural essences (in sweet milk). Japanese Coffee Kitchen – Slow dripped coffees, flavoured during roasting. 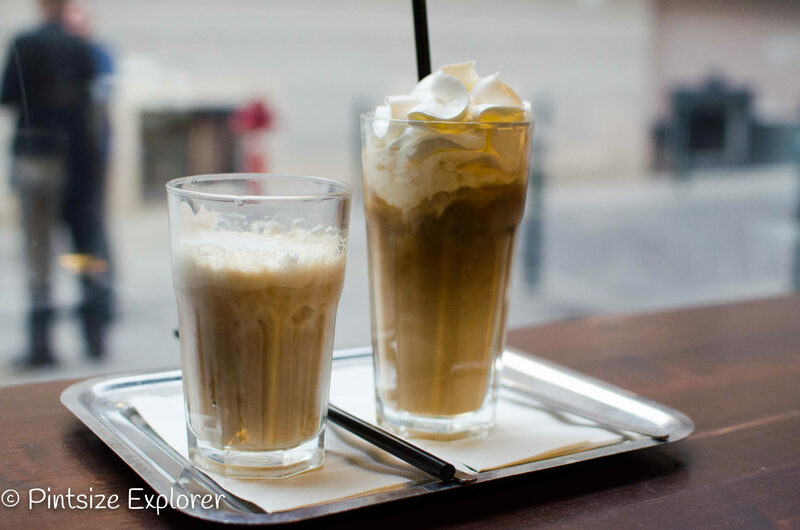 Artic and Glacial – European iced coffees, featuring frappes, lattes, mocha’s and cappuccino’s. Hot Chocolate and Caramel – Fresh, homemade with real chocolate. Drink Art – Using fresh, zero-tolerance fruit purees, these fruity lemonades look delicious! Loose-Leaf Tea – We aren’t here for tea, but for something different, check out the nine different varieties available to take home. 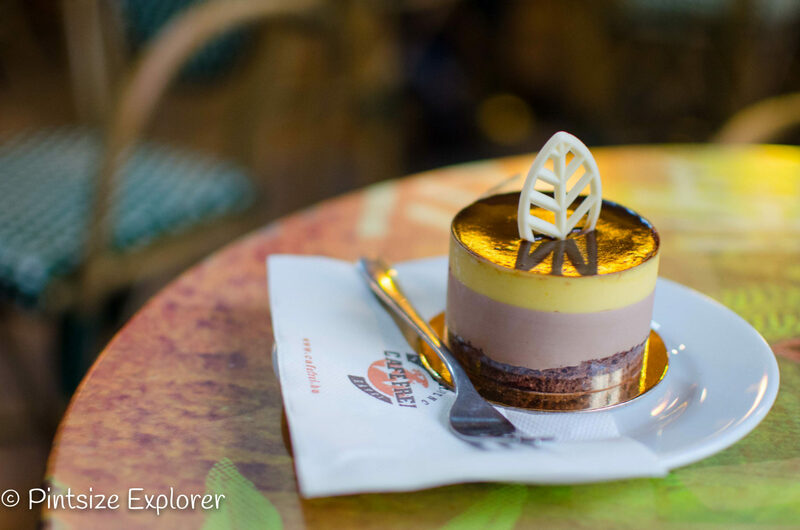 “Cakes Of 5 Continents” – No coffee would be complete without a slice of cake.. drool! The Mexican Café Con Leche was a safe option to choose. 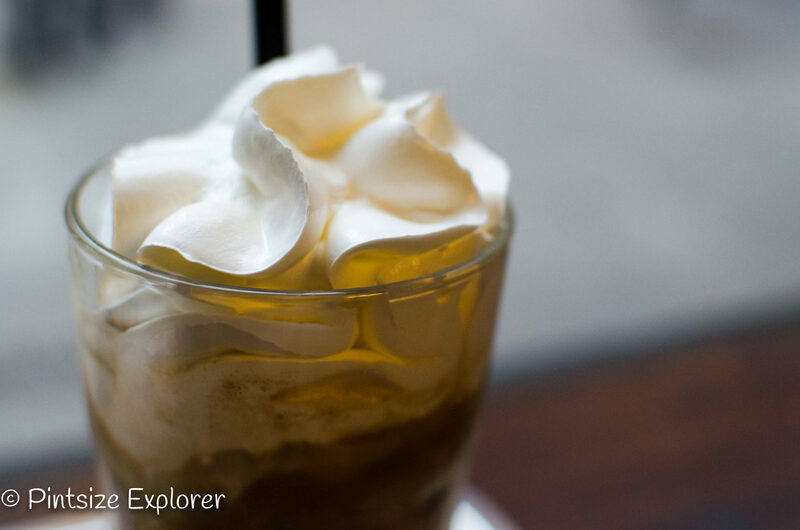 Anyone who likes a milky, sweet coffee will be a fan of this local ‘street corner drink’ from Central and South America. For my last drink, I made a brave decision to try something different with the Botswana Missionary Coffee. For me, this was too strong, and I just didn’t like the taste. Even though it was meant to be flavoured with orange (which sounded great), I found the tastes all too much. Adam went for the Scandinavian Multicult Coffee, which was bursting full of flavours, including orange, cinnamon, vanilla, caramel, cardamom, and nutmeg. I’ve just checked, and Adam thinks this was his favourite drink, so suggests you give this a try! Clearly Adam has a sweet tooth, as next on his ‘to-try’ list was the Ethiopian Ice Caramel Ginger Latte. This super sweet milky drink was piled high with whipped cream to compliment the sweet flavours. Adam also tried the Miami Beach Vanilla Latte, which stems from a mix of American flavours, and Latino sweetness. More sweetness for Mr sweet tooth himself! Ah come on, even the cakes from were around the world!! During the morning fresh pastries were available, however it was the cake selection that really made my mouth water! Of course, we had to sample one or two of these – how could we not! The New Zealand passionfruit and raspberry mini cake was exceptional! I was meant to be sharing it, but Adam didn’t get too much of a look in. I’m drooling at the thought of it right now. If you aren’t really a cake person (I mean, who isn’t a cake person?!?) then perhaps you’d be tempted by the coffee ice cream menu instead. We didn’t get to try any of these as it was pretty cold outside, but I have a feeling we may have missed out. Dam the rain and cold!! At the front of the store, there was a selection of sealed coffee beans available to purchase to take home. As with all the other coffee on the menu, the choice of twelve varities including some interesting flavours. Fancy the Tokyo raspberry with chocolate? 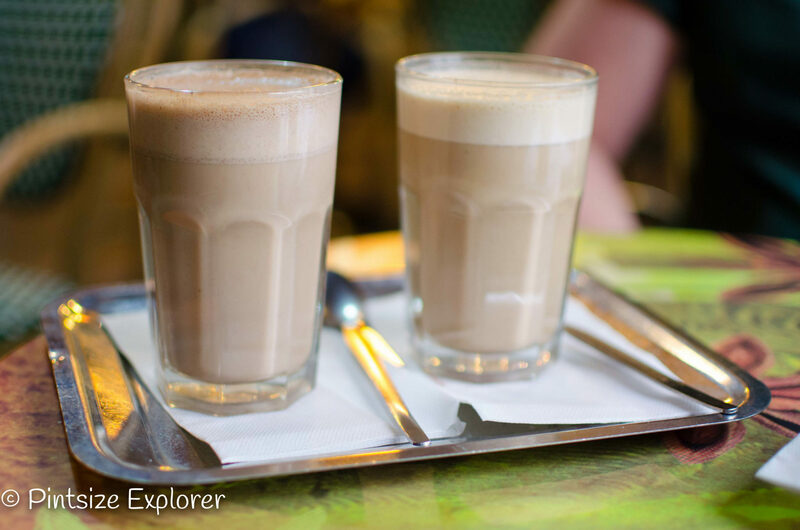 Amsterdam brandy coffee with caramelised orange? Or how about the Sydney liqueur coffee with mango extract? 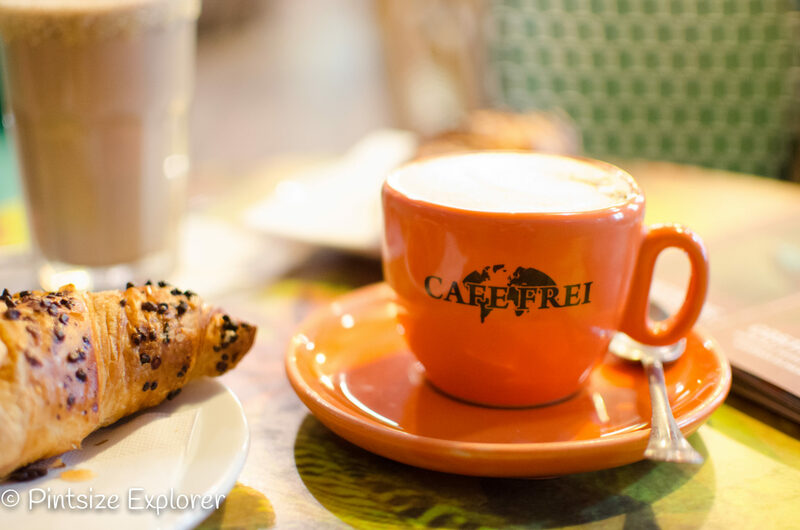 I am pleased to share that Café Frei has multiple locations throughout Europe, and even a cafe in Dubai. If you are visiting Budapest, Vienna, Romania, Nice, Dubai, or my hometown London, then pop by for a cuppa! Or if you are like me, three!